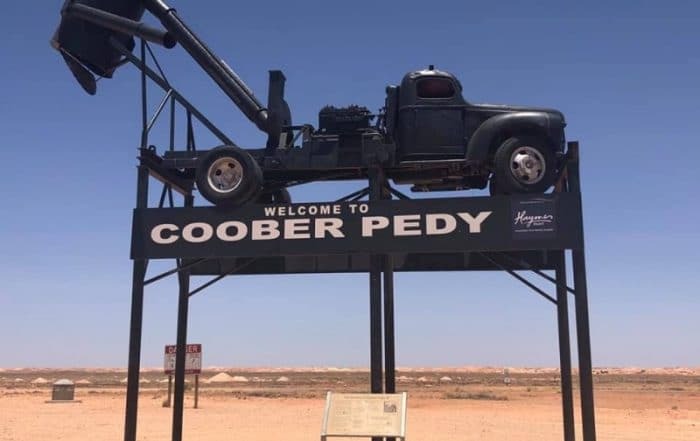 If there’s one thing Australia isn’t short of, it’s the ability to drive just an hour out from any of the cities and find yourself immersed in nature. The same can be said for Sydney, no matter how much we loved the hustle and bustle while we were there, we were always keen to find the next best day trip. No matter what kind of escape you’re looking for, whether it’s forests and lakes or cliff walks above the ocean, you won’t have to go far to find the perfect Nature day trips from Sydney for you. The first of the Nature day trips from Sydney that we highly recommend is Sydney’s Royal National Park. 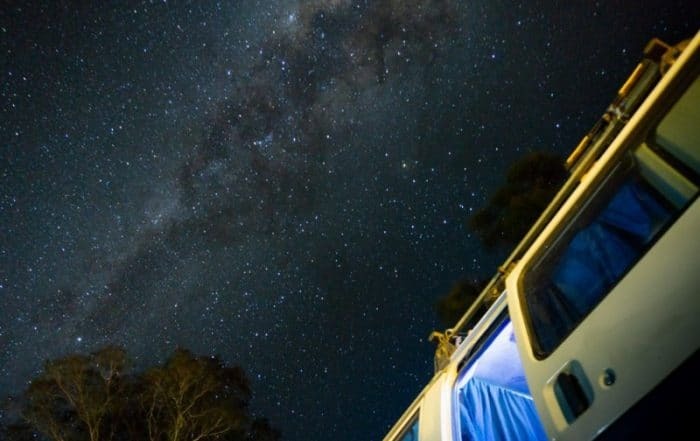 Just an hour from Sydney’s CBD, this national park is a balanced mix of everything. Beaches, coastal and bushland walks, it’s ideal for couples and families alike and an absolute must while you’re in the area. 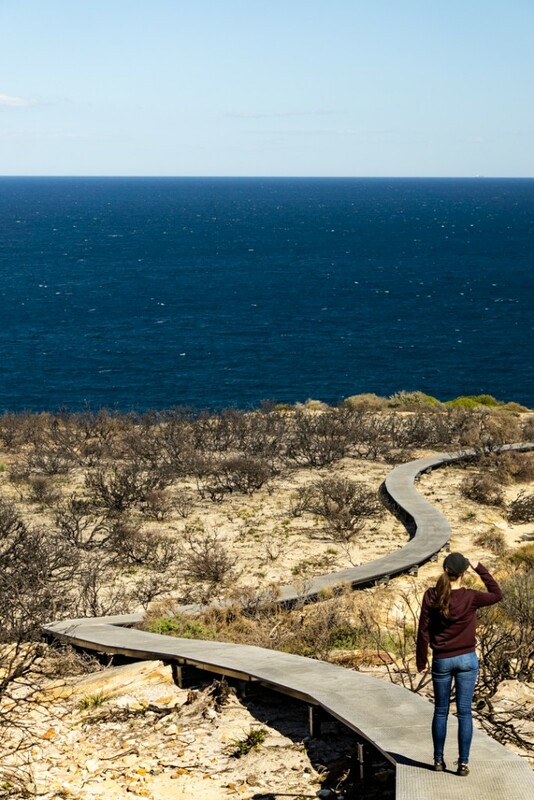 If you’re wanting a long walk with some great views the RNP coastal walk is perfect. There are several starting points depending on your fitness and how long you want to walk for. The track starts at Bundeena and will take you all the way to Otford. 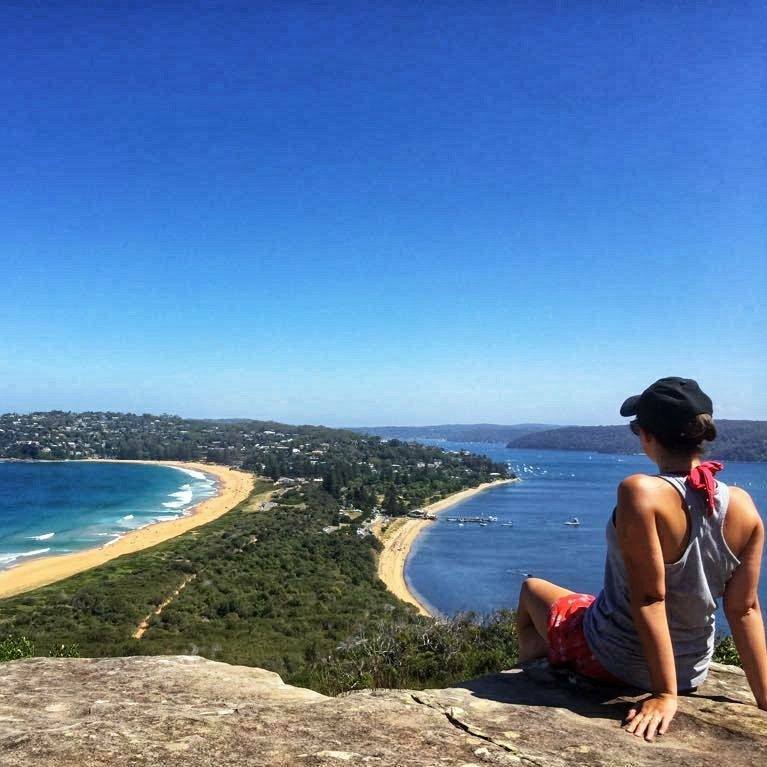 Covering 26km in total it’s recommended to spread it out over 2 days, however, we found the Bundeena to Wattamolla Beach section of the coastal walk a perfect choice for a nature day trip from Sydney. Not only does it throw you some amazing scenery but it’s a great viewpoint for migrating whales too. The track is a bit steep in places and currently graded a 5 (learn more about the grading system here) which means they’re recommended for experienced walkers. If you’re just doing a section of the track as we did, plan your route beforehand, know your limits and you should be ok. They’re in the process of adding a boardwalk to sections of the walk to make it easier for the less experienced. If you simply want a day trip away from Sydney that involves relaxing by the beach or indulging in a bit of aboriginal history, then Bundeena Beach is where you need to be. Ok Sydney has it’s fair amount of amazing beaches too but Bundeena feels so far removed from the city that it makes a nice change, it also isn’t full of other tourists. Catch a nice sunrise here or head up the coastal Jibbon loop track and explore the aboriginal caves and carvings. The Jibbon Track leads on to the Coastal Trail so be aware of the turn-offs and keep track of information boards so that you don’t lose the loop. From Bundeena you can also venture over to wedding cake rock, a unique cliff face that is popular with visitors. So much so they have had to erect fences to prevent people straying to close to the crumbling edges. So be careful. Due to it’s close proximity to airfields and helipads drones are not permitted within the Royal National Park so best to just leave them at home. 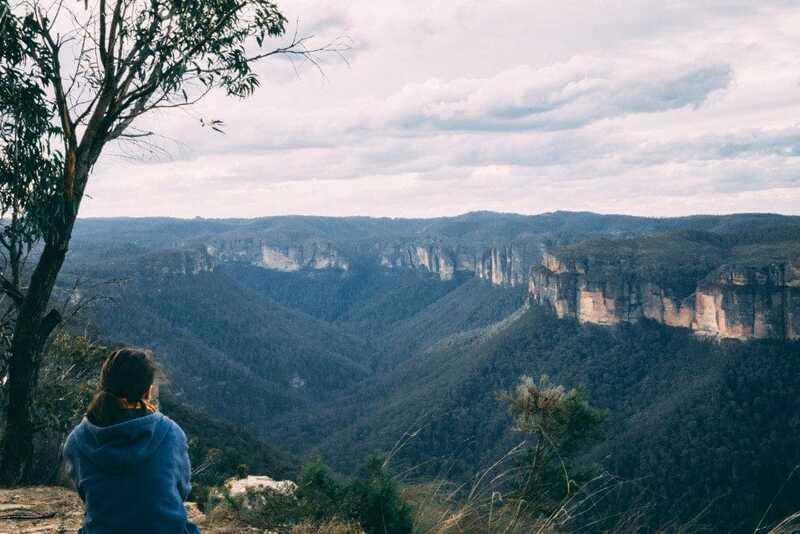 The Blue Mountains are a little further but they’re still a must-do on our list of Nature day trips from Sydney. You can either drive the 2-3 hours or wait until Sunday when your opal travel is $2.60 $2.70 for the entire day then get the train from Central station to Katoomba where you can either walk or catch the buses to each location. Something to remember; Sunday is the most convenient day for most people, which makes it the busiest day too. 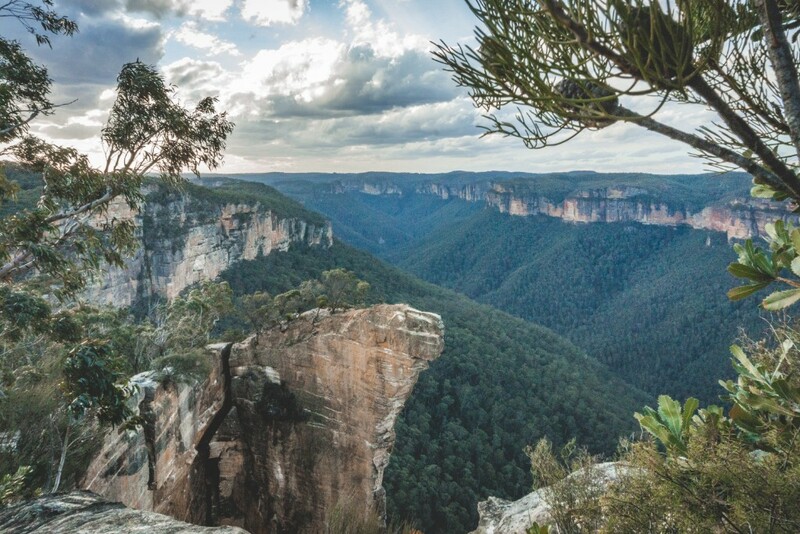 You’ll probably have seen photos, they’re the first stop recommended when you search for the Blue Mountains, so you won’t be surprised that it’s the most popular spot for tourists; bear this in mind when planning your visit. The walk from town isn’t too far, but there are also buses running frequently from the station. Once there, don’t stick to the overly tourist lookout point, explore the tracks or head to Eagle Lookout for a slightly less crowded view of the three sisters. We walked from Katoomba to the falls but there is parking or buses available if you prefer. Depending on how much rainfall they’ve had, this track offers some spectacular waterfalls and there’s always good views to be had from here. It does get busy depending on the day and time of year but when we went in the middle of summer it wasn’t too bad. 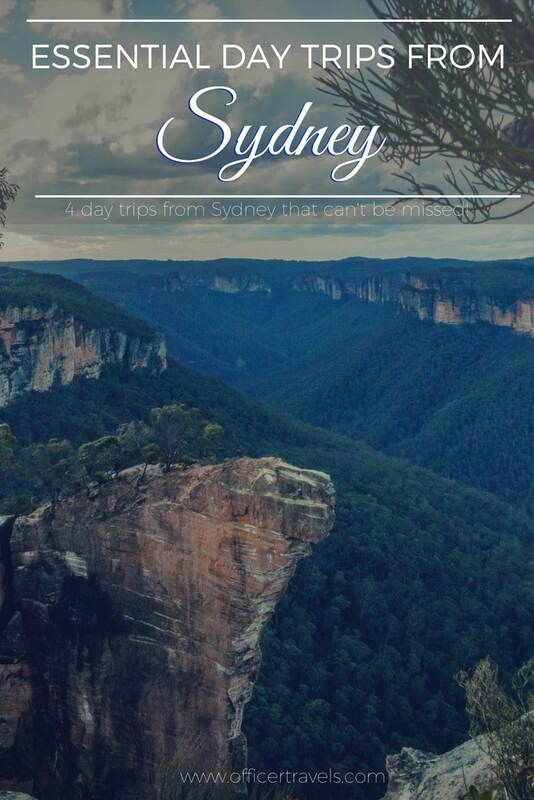 Out of all the spots in the Blue Mountains, we would say skip the three sisters and head to hanging rock. Not only is it less touristy (no fences, no coach parking, no crowds) but we also think it has the best views. While the lookout point does have parking, it is still down a slight dirt track but doable in a 2WD. The walk takes 50minutes each way following a clear path. You’ll reach Baltzer lookout first, this is where the official track ends and things get a little ‘risky’. Climb your way up the mildly steep track to find yourself on top of the world. Literally. This lookout isn’t fenced, it isn’t smoothed out for easy viewing, it’s raw mountain cliffs and the views are breath taking. If you want to push your day trip into a rock climbing adventure, head to the left of Baltzer lookout and find what looks like a steep rocky landslide. Believe it or not, down there is where you’ll find the perfect view point for hanging rock. Be careful. While it isn’t near the edge, it isn’t solid rock in some places and I lost my footing a time or two. Once on solid ground again take in the views and breathe a sigh of relief that you made it down in one piece. I hope there’s slightly less wind than when we were there!! Some might think this is a little too far to go for a day trip from Sydney, but we think they’re wrong. They are so worth the drive and if you’re already heading to the Blue Mountains, why not go that little bit further? Ok, they do deserve maybe a couple of days but they definitely shouldn’t be missed! The Jenolan caves offer a unique look into how our earth was transformed into what we see today. They’re the worlds oldest caves, and Australias longest cave tunnels. Complete with crystal clear lakes where you can see platypus, bush walks and the opportunity to explore the underground labyrinths, we don’t know anyone who wouldn’t enjoy it here. 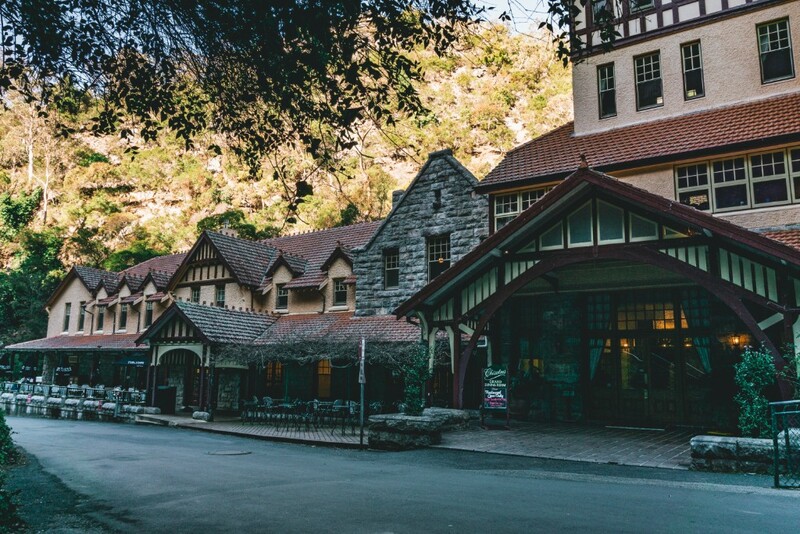 We did a more in depth post about why The Jenolan Caves make the perfect day trip from Sydney here. Once you’ve soaked up the recognisable coastline, if you still fancy a walk then the lighthouse route is beautiful, if only a little tiring. There are two routes from the beach, a quick way that’s steep with lots of steps or the long way that’s a winding path but not too steep. Each route will take you less than 45 minutes and the view from the top is 100% worth the chest pains. As always, plenty of water is right at the top! Even when it isn’t super hot, they involve a lot of walking! So it’s best to stay hydrated. Comfy shoes, a lot of these trips from Sydney involve steep walks or plenty of steps. Take it from someone who’s done them in flip-flops (or thongs if you’re Aussie…) it isn’t fun. Especially when the track turns to HOT sand. Layers, it might be a sunny day but once you hit the cliffs or mountain ranges on some of these trips it can be windy and cold! Be prepared to layer up to avoid cutting your trip short because you’re cold! If you’re only in Sydney for a short time and feel like you only have time to do one of these, it’s a hard choice but we think Sydney’s Royal National Park has a lot to offer for those on a short time budget. Especially if you’re here in whale season. 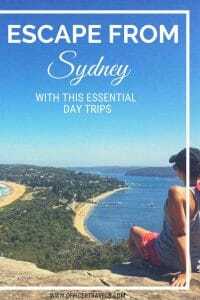 I think it’s safe to say that there are plenty of Nature day trips from Sydney that everyone will love, these 4 are our favourites. Have you been to any of these? What did you think? If you’re in Melbourne no worries, we’ve put together our favourite day trips from there too!! What beautiful scenery! That part of Australia looks a lot like the Western United States. I’d love to take a drive through there some day. Such quick gateways actually keep me motivated. Good that Sydney has so many choices. I would love to immerse in whale watching or aboriginal history walking. 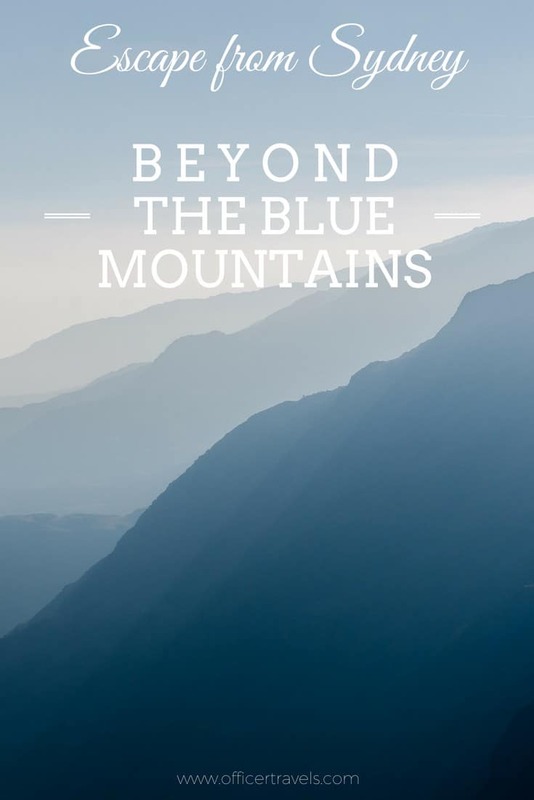 Blue mountains look gorgeous. All in all, you have prepared a good list. Oh wow, that’s awesome to know too thank you, Anja! They’re funny little animals. Scientists didn’t believe they were real at first! I hope you get to see whales in the wild one day!! Amazing post. 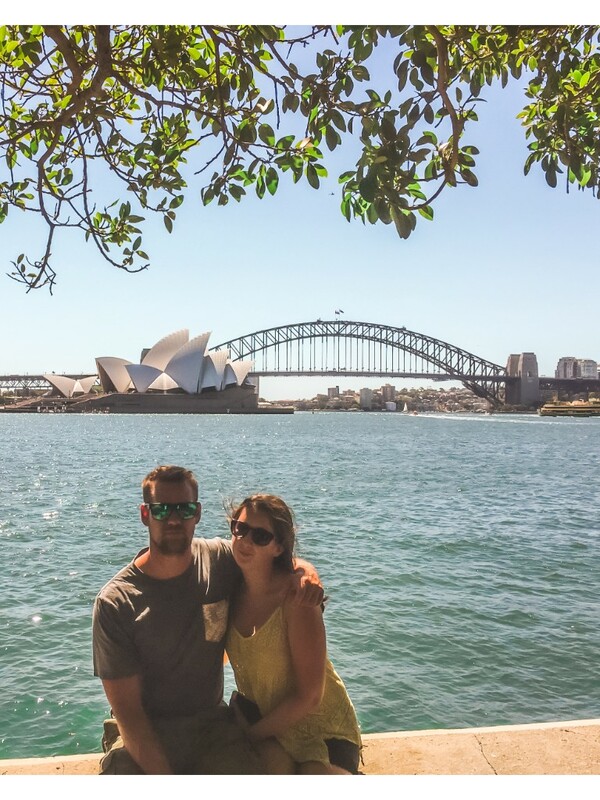 Loved reading this post about Sydney and very informative also. 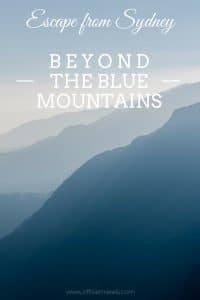 I am so fascinated by the Blue mountains and hope to be there one day. Thanks for sharing. 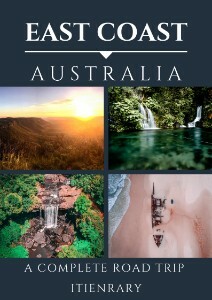 I haven’t been to Australia yet, but your pictures sure are inviting! I would immediately go for a day on the beach – but then, when I look at this picture of the Blue Mountains…can’t top that; literally. Just beautiful. Palm beach looks awesome. I could spend a couple of days just laying on the beach there. This is a great post. I love the fact that there is so much to do and see within a short distance of a city like Sydney. I would love to see whales like this! Is that your photo? We have been to Australia and saw whales in the distance when we were sailing near the outer reef, but have not yet been to Sydney. 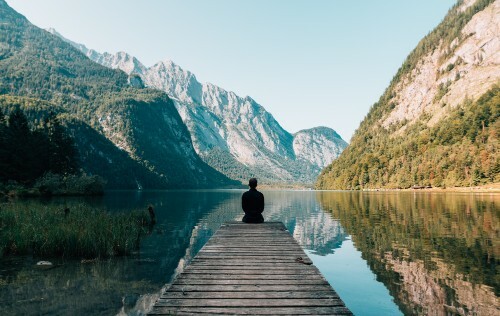 It is high on the list and we will definitely be checking out these hikes and day trips (though might take a bit longer at the Jenolan Caves). Thank Jane! I would definitely recommend longer at Jenolan Caves. It sure is my photo, all pics on Officer Travels are our own unless stated. It was quite close to the boat but also taken with a 200mm zoom lens 😉 Awesome animals though! Looks like I need to spend a few more days the next time I visit Sydney. 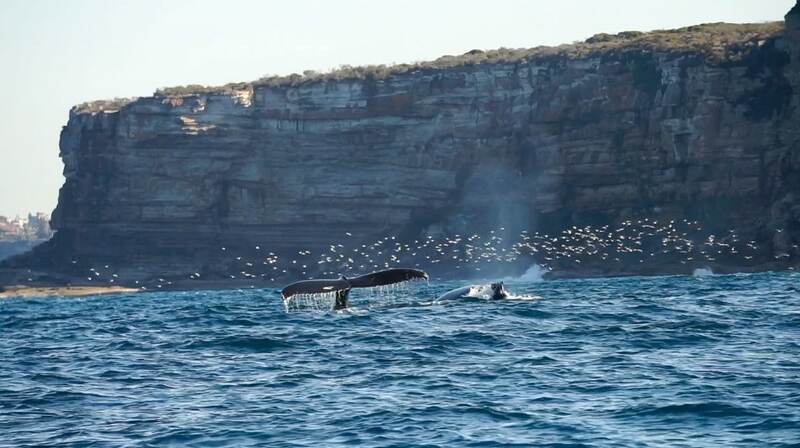 With the Royal National Park being only an hour away, it’s the perfect place to enjoy amazing scenery and to whale watch. Blue Mountains is a must! 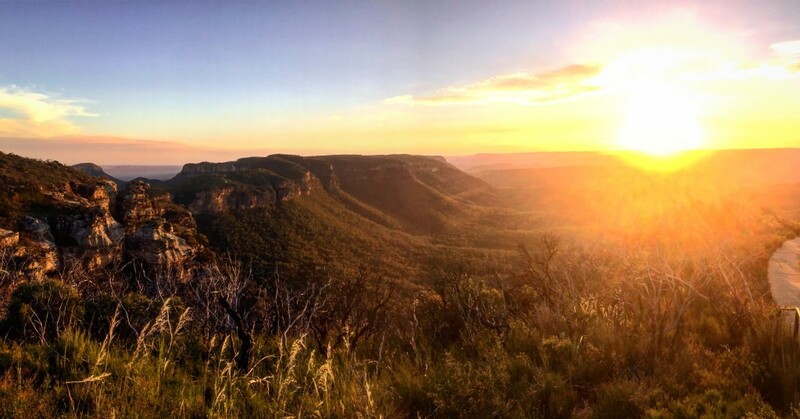 My favourite spot to view the Blue Mountains is Wall’s Lookout – the view is simply breathtaking. I used to watch Home & Away when I was a kid … how did I not know about Palm Beach. The steep walk is worth it for the stunning view at the top! Ooh we’ll have to check out wall’s lookout when we go next, it’s not one we’re familiar with. Honestly, we didn’t know Palm Beach was the filming location until we got there! It’s a beautiful bay! Our family would definitely been in for a trip to Royal National Park. It looks like a lot of fun and the kids would love an opportunity to see whales. But, we would also enjoy Bundeena Beach, Hanging Rock, or Jenolan Caves. Our daughter is fascinated with caves. I appreciate that you give some options that are out-of-the-way and less touristy. I love seeing new places and exploring, but I am not a big fan of crowds, so I appreciate these options. Thank you Lance, the Blue Mountains are a great place to escape the crowds so long as you avoid The Three Sisters, while beautiful it’s the biggest tourist trap in the area. You’re most welcome Kirstie! It’s hard to know how much time you need in this amazing country. I hope you get to come back at some point! I honestly had no idea that there was so much beautiful nature within an hour of Sydney! It makes a trip there even more appealing. Thank you Amber! They make for a great escape from the city that’s for sure! Great options all around. I did a few of these. Especially loved the blue mountains. They do look special at sunrise and sunset. Shot similar pictures too! 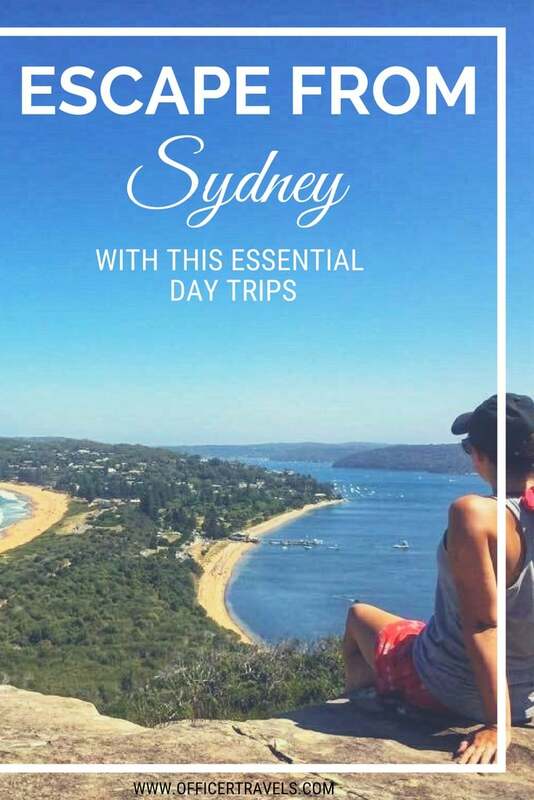 So many things to do around Sydney!